Agafia’s Siberian Pine Hair Conditioner is produced by the Russian beauty brand Granny Agafia’s Recipes for its 5 Juices series. It is specifically designed for weak and dry hair. The product restores the hair’s natural strength, nourishes and moisturises it, protects the hair against harmful environmental factors. Enriched with vitamin E. Approved by the Association of Traditional Medicine. Agafia’s hair conditioner is formulated with a combination of herbal extracts and Siberian pine nut oil. In Khakassia, Siberian pine is considered the epitome of strength and power and widely used in traditional medicine. The conditioner is rich in fatty acids and vitamins, it intensively nourishes the hair and strengthens it along the entire length. 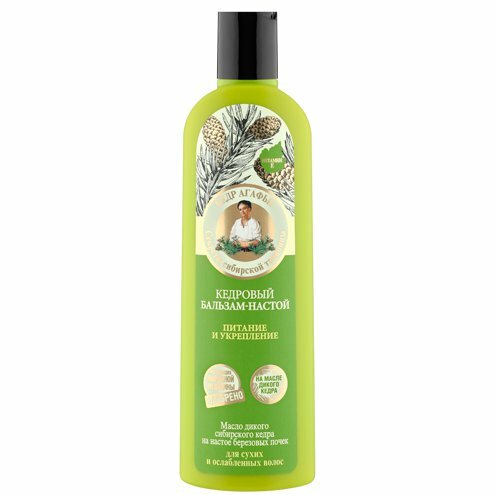 Siberian pine nut oil contained in the conditioner provides the hair with nutrients, improves its structure and makes your hair look healthy. The product also contains organic linseed oil which intensively restores the damaged hair structure and improves hair elasticity. The conditioner is enriched with birch but extract and shrubby cinquefoil extract which moisturise the hair, make it smoother and tamer. Directions. Apply onto clean, wet hair. Spread evenly along the entire length. Leave for 1-2 minutes, rinse with clean water. Ingredients. Aqua with infusions of Pinus Sibirica Seed Oil, Betula Alba Bud Extract, Potentilla Fruticosa Extract; Cetearyl Alcohol, Cetrimonium Chloride, Panthenol, Organic Linum Usitatissimum Seed Oil, Lauryl Glucoside, Guar Hydroxypropyltrimonium Chloride, Citric Acid, Tocopheryl Acetate (vitamin Е), Benzyl Alcohol, Benzoic Acid, Sorbic Acid, Parfum. Want to buy Agafia’s Siberian Pine Hair Conditioner? Call us or submit your order via our web site! Granny Agafia’s Recipes 5 Juices is a relatively new cosmetic brand produced by the well-known Russiaon company “Pervoe Reshenie” (First Solution). In 2002, this company launched its first cosmetic series, Granny Agafia’s Recipes. It included beauty products based on the traditional recipes of the Siberian herbalist Agafia Ermakova. 5 Juices can be considered a spin-off of the main cosmetic line. The specialists of “Pervoe Reshenie” are constantly working on new products, perfecting the formulas, improving production quality and finding more effective solutions to preserve the health and beauty of skin and hair. Granny Agafia’s Recipes 5 Juices is based on a combination of recent advancements in the field of cosmetic production with tradition remedies used by the indigenous population of Buryatia, Khakassia, Altai and the Far East. All the products in the series are based on one of the five Siberian plants known for their medicinal properties. These plants are Arctic cloudberry, Altai sea buckthorn, Siberian pine, Daurian juniper, and Nanai schisandra. They are extremely rich in vitamins and other nutrients which makes them valuable cosmetic ingredients. Juices and oils contained in the products branded as Granny Agafia’s Recipes 5 Juices are derived from the best and freshest berries and nuts picked from wild Siberian plants, which allows to preserve maximum nutrients. These oils and juices are combined with herbal extracts and innovative ingredients to produce an impressive effect. Try Agafia’s products out and see for yourself!